I read Steven Williams' Diocletian and the Roman Recovery in conjunction with Alaric Watson's biography of Aurelian (my review here). Like that book, Diocletian doesn't aim to revise the "standard version" of the emperor's reign so much as pull together the scholarship (as of 1985) about the period and lay it out with minimal fuss for the general reader. I don't have much to say about the book as such except to recommend it to readers interested in the period but unfamiliar with the history and make two observations. The first is that Diocletian bears a strong resemblance to Augustus, Rome's first emperor. 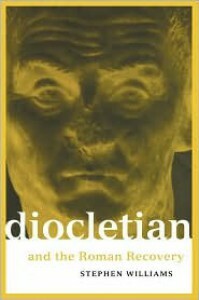 Like him, Diocletian "restored" the Roman world by revolutionizing it. The government and society that emerged after AD 285 may have claimed to be traditionally "Roman" but it bore little resemblance to Augustus's constitution. The second observation is that I appreciated Williams' treatment of the imperial cult and Diocletian's attempt to revive it. The "common wisdom" view tends to dismiss its seriousness and centrality to people's lives but Williams argues persuasively that people did take it seriously and that it did play a role in peoples' lives beyond a cynical acquiescence to imperial will. The cult ultimately failed because the society it mirrored was passing away, and - you'll remember - Christianity rapidly took on many of its trappings once it became the state's religion (albeit the focus of worship was subtlely shifted).